Sarnath, a world famous Buddhist site is about 10 kms. from Varanasi. In Sarnath, the Lord Buddha preached his first sermon at a deer park. The sermon is known as Dhammachakkapavattana or setting in motion the Wheel of Law in Buddhism. 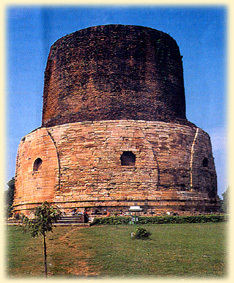 Sarnath became one of the great centres of Buddhism. The Emperor Ashoka erected magnificent stupas and structures in Sarnath. The Chinese scholar Huien Tsang who also visited Sarnath in 640 AD, wrote about the splendour of the city. This place was rediscovered and excavated in 1836. Sarnath is one of the most holy sites that attracts the people from all over the world. The people visit this place to pay homage to the great teacher and to attain spiritual perfection. 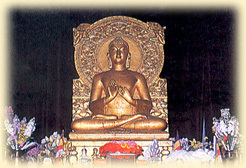 After attaining enlightenment at Bodhgaya, Lord Buddha went to Sarnath. In Sarnath, the stream of the Buddha's teaching first flowed. At this place, the Buddha encountered the five men who had been his companions of earlier austerities. Here in the Deer Park, he delivered his first sermon, or in religious language, set in motion the Wheel of Law (Maha-Dharmachakra Pravartan). The Emperor Ashoka (304 - 232 BC), who spread the Buddha's message of love and compassion throughout his vast empire, visited Sarnath around 234 BC, and erected a stupa here. The last and largest monastery constructed before the Muslim rule was Dharma-Chakar-Jina Vihar. This Vihar was erected by Kumardevi, wife of King Govinda Chandra, who ruled over Banaras during 1114 to 1154. In 1194 AD, Qutb-ud-din-Aibak, the Muslim conqueror, leveled the city to the ground. Sarnath became a forest of debris below which the historical ruins remained buried. Several Buddhist structures were raised at Sarnath between the 3rd century BC and the 11th century AD. The main tourist attractions in Sarnath are the Stupas, excavated ruins of monasteries, Ashoka Pillar, Deer Park, where the Buddha delivered his first sermon, Dhamekh Stupa, Bodhi tree, Moolgandha Kuti Vihara and Archaeology Museum. Of the two great stupas which adorned the city only the Dhamekh Stupa survives which belongs to the 6th century. This imposing stupa which is about 39 m high, was erected in 200 BC in the Mauryan era. This stupa was rebuilt a number of times. The geometric and floral patterns on the stupa belong to the later Gupta period. 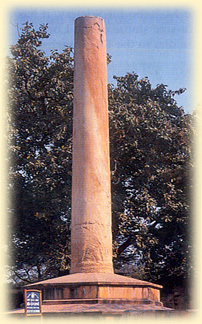 This pillar was erected by the Emperor Ashoka. The pillar had his edict engraved on it. This stupa is about 15.24 m in height and had four lions as its capital which is now treasured in the archaeology museum. The lion symbolises both Ashoka's imperial rule and the kingship of the Buddha. The four-lion capital was adopted as the emblem of the modern Indian republic. The Mulagandha Kuti Vihar is a modern temple erected by the Mahabodhi Society. It has a life-size statue of the Lord Buddha in the Dharmachakra Pravartan form. It also has excellent frescoes by Kosetsu Nosu, Japan's foremost painter and a rich repository of Buddhist literature. The sapling of the Bodhi tree was brought from the famous tree in Anuradhapura, Sri Lanka, which in turn originated from the original tree at Bodhgaya, under which the Lord Buddha attained enlightenment about 2,500 years ago.